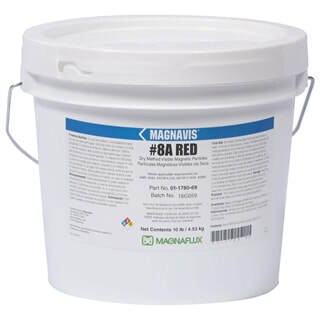 #8A Red provides strong contrast on most metal surfaces during dry method mag particle testing in visible light. It is ready-to-use for visible light flaw detection of surface and slightly subsurface discontinuities in ferrous metals. It can be used in a powder blower or shaken from a bottle during magnetization, and blown off while current is still being applied. On material with a high magnetic retentivity, indications can still be formed after the current has been turned off.